Need to submit a printed page(s) into a Moodle Assignment? Here's how to do it. 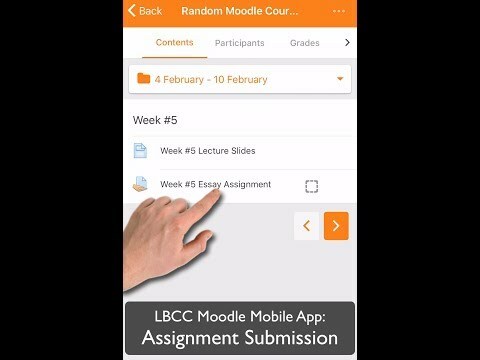 Here is how to get logged in to our Moodle system for the first time with the Moodle mobile app. Are you using Ally, our LMS accessibility tool, or interested in using it in your Moodle course? If so, you may want to bookmark this page, as it is kept up-to-date on improvements in each version update. You can also follow the page by subscribing with your email address here. And speaking of subscribing, you are subscribed to this blog, too, right? If you weren't able to make the recent TurnItIn training session, no worries - it was recorded. You can view the recording here. You have probably built a number of Resources and Activities in your Moodle course(s), but did you know you can create duplicates of them? This is a great way to make sure everything functions consistently for you and your students from week-to-week. "The Book resource in Moodle is a series of connected Moodle Pages. It is suitable for replicating a text book or a manual. In addition to text, video, audio, images; web sites, interactive activities and links can be included on Book pages. Possibly, some of us discount the Book module as a place for incorporating interactivity as it is listed in the Moodle Resources section of the Add an activity or resource chooser." A colleague came to us this morning with an issue regarding Google Drive. She had a PDF in her Google Drive that she had created from a hard copy scan, and when she uploaded another PDF with the same name, she noticed Google Drive had replace the original file with the new file. I had a bit of familiarity with how to update a PDF in Google Drive to a new version manually (more on that later), but hadn't seen or noticed it happening automatically. Of course, a lot of people just click right through those and continue working, but I figured if it's happening to one person, it's happening to others, too, so here is the blog post to cover you. The solution we landed on comes from right-clicking the PDF in Google Drive, and then clicking "Manage versions…"
Now for the ADDED VALUE feature of this post: look at the "UPLOAD NEW VERSION" button in the "Manage versions" popup above. You can manually update a PDF to a new version! That may not seem so exciting until and unless you have a link to a PDF in Google Docs appearing on a website(s), and need to update it. No need to update the URL - just upload a new version! 14:15: "I just want to talk about training and development because, this is the big one. It doesn't matter what your technology is, it doesn't matter how much money you've spent on hosting, it doesn't matter which Moodle Partner you're working with, it doesn't matter how many great IT people you bring in, ultimately, the biggest single factor on the success of your Moodle site is the understanding and the level your staff on the ground floor, on the whole interface, working with students, how much knowledge they have to use Moodle effectively. Again and again, the biggest area we see for improvement and some effort." Yesterday the Moodle team completed Phase 1 of our multi-part updates to Moodle (Moodlemorphosis). This summer we will pilot this first set of changes and make any needed corrections before the fall term. The recent changes mostly affect Moodle navigation and appearance. Please provide feedback! We'll continue developing improved support resources over the summer. In the fall, we will turn our focus to enrollment and course management processes. User tours: You will see pop-up user tours that are meant to introduce you to changes and new elements of Moodle. If you close a tour early or want to return to it, you will find an option to reset the tour at the bottom of the Moodle page. Please spend some time going through the tours! Faculty Resources: We also hope that you'll take a minute to review the redesigned Faculty Resources page. You are able to access these resources without logging in from the elearning.linnbenton.edu page and once logged in, Faculty Resources are always one click away through the Nav Drawer (in the left column). Support: The best way for faculty to get Moodle support over the summer is to use the email lms-admins-lb@linnbenton.edu. Messages sent to that address will go to me, Eric, and Paul. Students should continue to use the Student Help Desk. Training: We'll offer training sessions to review changes during non-instructional days this fall and will continue Moodle Monday and Tuesday drop-in sessions. You're welcome to schedule one-on-one training with Paul or Eric at any time.